Many may wonder what the holiday was like 150 years ago during the first winter of the conflict. The Washington area was home to thousands of young men who had never been away from home for Christmas. The soldiers had to celebrate as best as they could, combating homesickness while trying to experience just a little holiday cheer. Many accounts remain of what Christmas was like for the Union soldiers encamped across the Potomac from the nation’s capital. 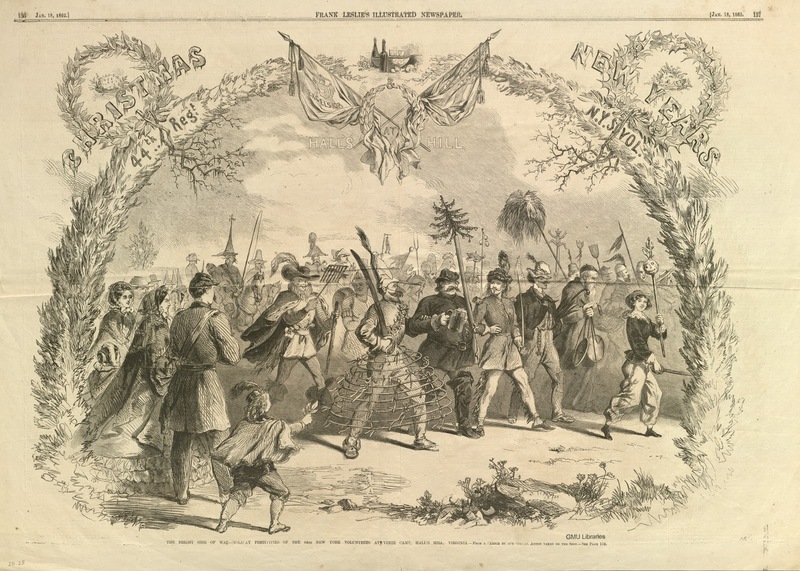 The Christmas of 1861 sees the world full of strife and our own land full of rebellious contentions and traitorous designs. . . . If man has failed in the performance of his duty to man. . . . Christmas comes to us shorn of none of its holy glory or diminished in no degree in any of its sublime promises. It is still the anniversary of the Savior’s birth, an epoch in the world’s history unequalled by any other for glory, grandness, and Heavenly love. . . . It must be the Christmas of the soul, though our hearts are sorrowful. It must be a Christmas for those at home, though many homes are now made desolate by the absence of their ornaments; and we trust, too, that while men are arrayed in battle, the Christmas of the year will be made glad for the children of the land. As the soldiers around the nation’s capital looked to the year ahead, they could only guess as to where they would be next Christmas. Camp was no substitute for home, but at least the soldiers had made the most of the holiday. Now the men would return to army life, hoping that next year, they would be gathered around the fire with loved ones.